1 Most people do not like cockroaches, spiders, and millipedes very much. But believe it or not, some people keep them as pets. These creepy, crawly creatures can make interesting pets if you know what to do...and how to keep them where you want them. They don't need exercise, grooming, or shots. Not all bugs are as friendly as tiny but bold Flik from A Bug's Life. 2 If you are one of those rare people who might like one of these unusual pets, you have many from which to choose. 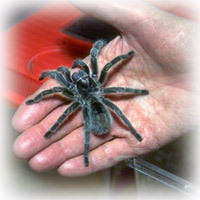 There are more than 45,000 kinds of spiders, 4,600 species of cockroaches, and 12,000 species of millipedes. Many of these creatures spend a lot of time in people's homes, but not as pets. Many people just think of them as pests, especially cockroaches. 3 Cockroaches are strange pets, but if you want one, you should be sure that you follow the rules. Some states require a permit from the Department of Agriculture to keep cockroaches as pets. Cockroaches need a house with a tight-fitting mesh lid that will keep the cockroaches in and allows air to enter it. Cockroaches are not picky eaters. They will eat almost anything, and if they don't get enough food, they will even eat their cage...or each other.